An East End Family Memoir: The story of one East End family, across three generations, living on the fringe of the Thames. Silvertown itself is a ribbon of marshland that sits beside the King George VI dock near Bow Creek. In 1944 Melanie McGrath’s grandfather Lenny, bought the Cosy Cafe in Silvertown. From here Lenny, his mistress, his wife and his daughter served egg and chips, liver and bacon, eels and jellied custard to the passing trade from the thriving docks. Business was good. By the late 1940s Lenny was the only Cafe owner in the East End to drive a Cadillac. Like many others on the fringes of the Thames in East London, the story of Melanie McGrath’s family is a tidal one. Originating from other parts, her family spilled into the area to take advantage of the docks and, having made a little money spilled back out to the West again. 50 years on, Silvertown stares the Millennium Dome square in the eyes. In the past half-century the Docklands terrain has been bombed, rebuilt, renovated, slum-cleared and finally razed pending “regeneration”. Overlooked by successive enterprise projects that have created the City Airport, Canary Wharf and the Dome itself, the waters of Silvertown sleep, awaiting a future that remains undecided. 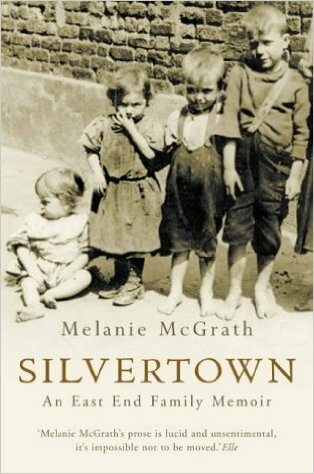 In this book Melanie McGrath has, through the story of her family, recaptured this slip of land from its post-industrial depression, and with it the traditional heartlands of East London before each fades quietly from memory. The night is damp now, but their bellies are warm with tea and they appear to have a purpose, marching along St Leonard’s Road, then turning west towards Chrisp Street where a few men stand quietly behind their market stalls and a few women still mill around in the hope of some day-end bargains. Sarah, who has said nothing all this way, now takes her daughter’s hand and leads her through the alleys towards Limehouse, and finally to a dingy shop front whose glass has been partly covered with a large splinter of wood. They stop before the door and Jane glances enquiringly at her mother. Inside is an oily wooden floor, a bell above the door, some broken shelving containing bottles, a few dilapidated rush chairs and a thin film of dirt embroidering everything. A metallic smell pervades the air. Hearing the bell, a stout man in his fifties emerges from the back room, his face scrubbed clean, the skin as red as cat’s meat. Ah, says the stout man, the young lady. Well, says Sarah in an awkward tone, a mixture of guilt and overweening politeness. Well, I’ll be off then. The stout man continues to smile. Then he goes to a hook on the back of the front door and takes down a butcher’s apron. It takes three hours to pullout all the teeth in Jane Fulcher’s mouth. Three quarters of a century later she will still recall the head-popping splintering, like the south of the earth cracking open. She will remember the blood and ruby spittle and the fragments of tooth falling from her lips, the mouth jammed with metal and the butcher’s foot on her chest as he digs out her molars. The pain begins as a slow howl somewhere beneath or behind her stomach, which leaks into her extremities and finally wraps itself around her like seaweed, dragging her down into the pitch dark of nightmares. The butcher’s favoured tool for his operation is a monkey wrench, more commonly used for unscrewing rivets and rusty bolts. There is no anaesthetic. Jane is strapped into a chair with dockers’ belts. Every so often an old woman appears and offers her a jar of cheap hooch and tells her to drink deep and stop making a fuss. But it’s hard not to make a fuss when blood is pouring down your neck and pooling in your lap. It’s hard not to make a fuss when your lips are swelling and your cheeks are blowing up and your moth has become an ugly tangle of red, housing gums so raw it feels as though they are about to burst and scatter the bits and pieces of your face across the floor. It goes on an on, the three longest hours of her life. She cries and sobs and shakes, begging for it to stop until the butcher threatens to give her a good clump over the head with his wrench to give her something to think about. At the end of it all, stumbling from the greasy room on the arm of the butcher’s wife, through well-worn and familiar streets, she cannot see through the monstrous throbbing in her head. She cannot speak or hear anything other than the sound of splintering. The butcher’s wife tries and fails to comfort her. She has the strangest feeling of absence. If someone were to stop and ask her name she wouldn’t be able to summon it. Where’s the comfort to be had when on your seventeenth birthday your mother delivers you to a butcher to pull out all your teeth? By the time the butcher’s wife hands Jane over to her mother her face is a globe of raw liver. Cup of tea, pet? her mother says. No? Well, then. ‘I so much enjoyed Silvertown. Its characters and dialogue have such warmth and vitality that they keep jumping out of the page. I loved the toughness and robustness of the descriptions, without any sentimentality or cliches. It will provide insights and surprises for anyone with a feel for social history and that amazing post-war revolution.